Proceeds from the concerts will go to Na Lei Na'auao, an alliance of 12 Hawaiian culture, community and environment-based charter schools. 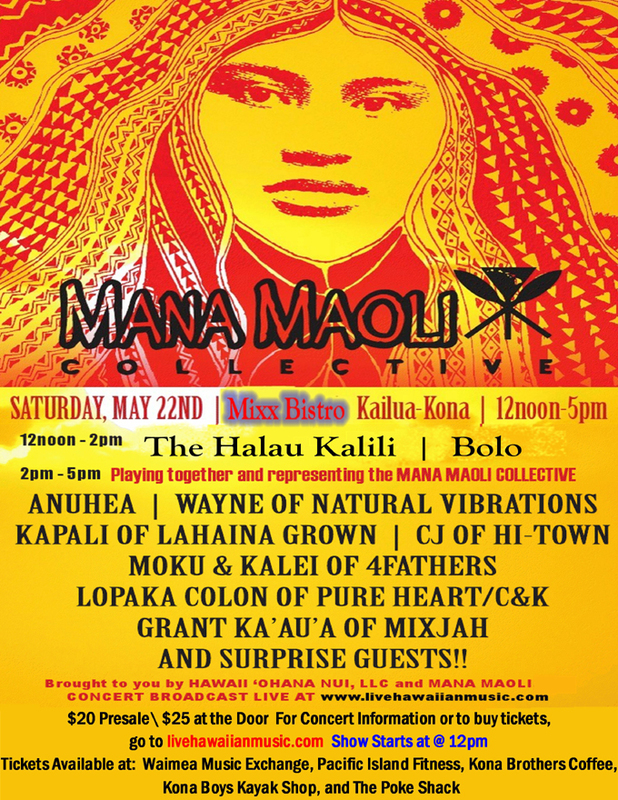 The Mana Maoli Collective (MMC) Concert will be held in Kona on Saturday, May 22, from noon to 5pm at the Mixx Bistro at Kamehameha Mall. The concert will also be broadcast live around the world on http://www.livehawaiianmusic.com . Tickets are $20 presale and $25 at the door, available at http://www.livehawaiianmusic.com , Kona Brothers Coffee, The Poke Shack, Kona Boys Kayak, Pacific Island Fitness and Waimea Music Exchange. Returning home from a 3-week tour in Aotearoa (New Zealand), the Mana Maoli Collective (MMC) has planned a May concert series consisting of four music and hula performances across three Hawaiian islands – O‘ahu, Maui, and Hawai’i. Proceeds from the concerts will go to Na Lei Na’auao, an alliance of 12 Hawaiian culture, community and environment-based charter schools. The MMC hosted workshops and performed in nearly 2 dozen shows across 5 cities in Aotearoa. The impetus for the tour was the 18th Annual Pasifika Festival, which attracts over a quarter million people annually from dozens of nations in the Pacific. The MMC had the honor of being the first group of Hawaiians to represent traditional and modern music and dance at this festival, as the headline act on the main “international” stage. Do not miss out on a collaborative performance this rare. The unique styles and sounds of these artists form an innovative weave of what we call Maoli Music – from traditional Hawaiian to contemporary, jazz to reggae, and blues to hip-hop. Designed to bring you the whole of Hawaiian Music, this concert is brought to you by livehawaiianmusic.com, All Things Creative, Texeira Edwards Farms, Huggos, Senator Josh Green, and Mana Maoli Collective. For more information on the Mana Maoli Collective, or if you are interested in supporting Mana Maoli, contact Keola Nakanishi at 808-295-MANA (808-295-6262) or keolanakanishi@yahoo.com for more info about the concert call (808)-769-0998.